and then all you need to do is insert the disc. You must have the minimum required computer system. Follow these instructions to Purchase, Download and Install from our Secure Ordering Site. After ordering, you will go to your order confirmation page. The confirmation page has a DOWNLOAD NOW button. Click the button to begin downloading the application file to your system (elect to SAVE the file to an empty folder on your hard drive). Once the download is complete, run the file to install Cadrail. See the more detailed instructions below. Note: the images shown are for Windows 7 systems. If you have an earlier version you may see slightly different images. The software or version number shown may be different than your order. 1. After placing your order you will go to your status page. Click the download link to begin downloading. 2. Click the SAVE button that appears on the bar at the bottom of the browser (or on the dialog) and then SAVE AS. 3. When the Save As dialog appears, select an empty folder on your hard drive. Note the folder and file name so you can later locate the file and run it. Click the SAVE button to continue. 4. After your file downloads, click the VIEW DOWNLOADS button and the bottom of your browser (or navigat to the file Windows File Explorer and run it). 5. After the downloads dialog appears select RUN. 6. 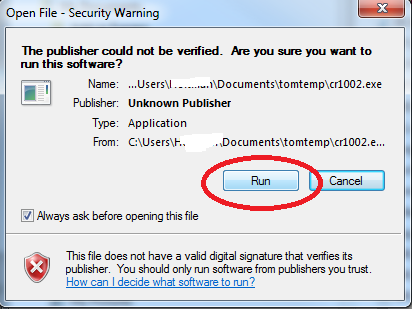 If you get a security warning, select Run anyway. 7. After the setup program begins, follow the setup instructions to install Cadrail.